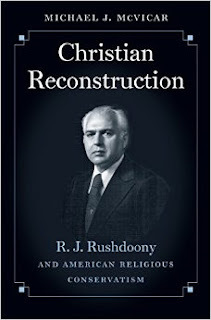 Today is part 2 of my interview with Dr. Michael J. McVicar about his book Christian Reconstruction: R. J. Rushdoony and American Religious Conservatism (University of North Carolina Press, 2015). Read part 1 of the interview here. Phillip Luke Sinitiere (PLS): Can you pinpoint some of Rushdoony’s major impacts—even legacies—within the broader worlds of religious and political conservatism in the U. S.? In this regard, how does your book connect to the recent and related studies by Molly Worthen, Matt Sutton, Kevin Kruse, and Tim Gloege, among others? Michael J. McVicar (MJM): Arguably, Rushdoony’s singular achievement came not in the form of Reconstructionism, but in his advocacy for Christian homeschooling. In the 1950s, Rushdoony began arguing that conservative Christians had a theological and religious obligation to free themselves from state-funded public schools. By the 1960s, a series of U.S. Supreme Court Rulings—ranging from controversial integration decisions to orders banning school prayer and religious instruction in public schools—made Rushdoony seem especially prescient. Concerned parents flocked to his lectures and he built a grassroots network of lawyers, educators, and activists who challenged compulsory state attendance laws and other regulations limiting parents’ ability to educate their children at home or in private Christian schools. He eagerly cooperated with left-wing homeschooling advocates or adherents of other religious faiths so long as they shared his view of the educational autonomy of parents. Rushdoony also had a broad influence on conservative grassroots political activism from the 1960s through the 1990s, but most of this influence came at such a granular and decentralized level that it is nearly impossibly to assess the scope of his activities. Hints of Rushdoony’s broader influence can be found in the current popularity of free market economic theories among conservative Protestants—a trend facilitated by Rushdoony’s economist son-in-law Gary North. Rushdoony was a significant beneficiary of the network of corporate interests most recently highlighted in Kruse’s recent work on the relationship between midcentury corporate and religious interests. Rushdoony played an overlooked role in contributing to the intellectual vision of organizations such as Spiritual Mobilization, the Foundation for Economic Education, and the Christian Freedom Foundation. Further, Rushdoony helped subtly shift some evangelicals to rethink—but not reject—premillennial eschatology in relationship to postmillennial themes—especially as they relate to patriarchal visions of large families expanding over subsequent generations to Christianize the world—in some conservative ministries. This is important in relationship to in American Apocalypse, because characters such as Rushdoony and the Reconstructionists he inspired simply don’t fit in Sutton’s narrative. Rushdoony represented a mode of postmillennial eschatology that has strong traditional connections to the various ethnic Reformed polities in the Midwest—especially Dutch Calvinism—and old-line Princeton a- and postmillennial eschatology. As I argue in the book—and in more depth elsewhere—Reconstructionist postmillennialism did play a subtle but important role in challenging the dominance of premillennialism in the 1980s. It would be a gross exaggeration to claim that Rushdoony changed the eschatological discussion, but it wouldn’t be wrong to say he made many popular figures think carefully about the political and social implications of premillennialism. In the end, it might be best to read my book as a sunbelt mircohistory. That is, it is most clearly in dialogue with works by Lisa McGirr, Michelle Nickerson, and Darren Dochuk. It affirms the observations of these works, but it does so by focusing on the ministry of a largely overlooked figured from California who had direct connections to many of the characters and organizations discussed by the aforementioned authors. My book highlights how Rushdoony built Reconstructionism out of a network of small Calvinist and Reformed churches scattered across the South, Southwest, and Midwest. The narrative suggests that even a tiny, decentralized movement of committed activists could have a disproportional influence on larger social and religious movements during the twentieth century. PLS: You write that you had unique and essentially unfettered access to Rushdoony’s papers and files, and massive library. Can you discuss the archival and documentary foundation of your book? MJM: I did the primary research for the book over two separate trips to Rushdoony’s library in Vallecito, California. When I began the project, I knew that I needed more than the available secondary literature on Rushdoony and Reconstructionism. I also wanted to avoid relying too heavily on the published writings of Reconstructionists. The secondary literature is rife with hyperbolic half-truths about the movement that treat it in an ahistorical manner, while the Reconstructionist literature is triumphalist, polemical, and of little historical value for assessing the organizational development of the movement. Consequently, I worked on building an open and honest exchange with Rev. Mark Rousas Rushdoony, R. J.’s son and the current president of the Chalcedon Foundation, about my research agenda. After a few months of exchanges facilitated by Chris Ortiz, the former PR man for Chalcedon, I asked Mark Rushdoony to review and comment on an essay I was writing for Public Eye, the magazine of the left-leaning Political Research Associates. When Rev. Rushdoony saw that I intended to write a richly contextualized historical study of the development of Reconstructionism and Rushdoony’s ministry, he agreed to let me into his father’s library. He allowed me complete access to the entire library, with the exception of some legal records related to his father’s divorce. I could photograph and digitize anything I wanted. After a visit in 2007 and another in 2014, I captured thousands of digital images of letters, journals, book manuscripts, and administrative files from the Chalcedon foundation. They form the archival heart of the book. PLS: What current projects are you working on? MJM: I’m currently developing a new book-length project that investigates the complex interaction between religion, domestic intelligence gathering, and the emergence of political conservatism in twentieth century U.S. culture. The project will specifically focus on the history of intelligence gathering operations operated by religiously affiliated organizations during the course of the twentieth century. I’m currently studying a network of organizations including the American Intelligence Agency, the Anti-Defamation League, the Christian Crusade Against Communism, the Church League of America, Group Research Associates, and the John Birch Society. My hope is that by concentrating on the development of intelligence and dossier gathering operations operated by religious organizations (or groups committed to resisting certain religious organizations), the project will illuminate the contested systems of bureaucracy, archiving, and the materiality of memory-making that developed in state, corporate, church, and private organizations in the middle of the twentieth century. 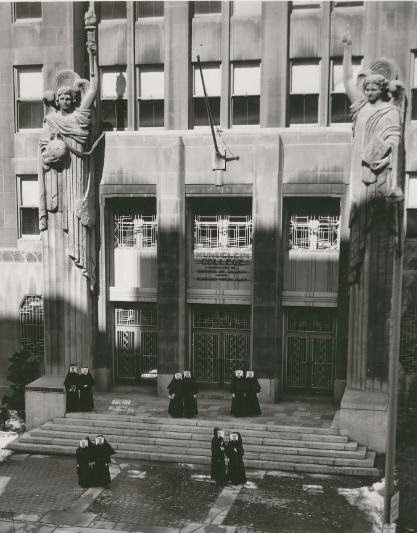 The project will synthesize recent insights from material history and media history with religious studies to explore key issues related to race, political ideology, gender and the contestation of social boundary formation during the Cold War. Thanks to both of you -- I learned a great deal from this interview and look forward to the book! The secondary literature is rife with hyperbolic half-truths about the movement that treat it in an ahistorical manner, while the Reconstructionist literature is triumphalist, polemical, and of little historical value for assessing the organizational development of the movement. Consequently, I worked on building an open and honest exchange with Rev. Mark Rousas Rushdoony, R. J.’s son and the current president of the Chalcedon Foundation, about my research agenda. After a few months of exchanges facilitated by Chris Ortiz, the former PR man for Chalcedon, I asked Mark Rushdoony to review and comment on an essay I was writing for Public Eye, the magazine of the left-leaning Political Research Associates. When Rev. Rushdoony saw that I intended to write a richly contextualized historical study of the development of Reconstructionism and Rushdoony’s ministry, he agreed to let me into his father’s library. He allowed me complete access to the entire library, with the exception of some legal records related to his father’s divorce. Inspiring, and a model for all. Excellent interview and props to Mr. McVicar for letting his subject speak for himself sans judgment or editorial. Those given access to source documents [before they vanish!] bear great responsibility, and let's face it, access will be granted by the survivors of controversial figures such as Rushdoony only if they trust that they'll get a fair shake.